Source: Subgroup II. Eleanor B. Stevenson papers, Series 6. Photographs, Box 2. Stevenson Papers, RG 30/219, O.C.A. Location: Subgroup II. 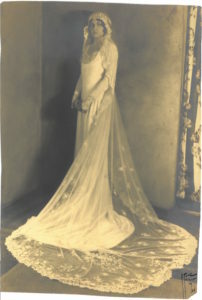 Eleanor B. Stevenson papers, Series 1. Correspondence, Box 1. William and Eleanor Stevenson Papers, RG 30/219. O.C.A. To: 337 W. 22nd st. I love you frightfully and find myself in a wretched humor after you have left us. How glad I am that in the course of a few months we won’t have to face this continued separation. It is telling on my already shattered nerves. Darling I do a great deal of childish joking but really I do love you very much and have every intention of remaining in this state. We will be loyal and faithful to each other. I know we are here primarily to make good Mothers & Fathers & good citizens and there is only one way to do it. You mean every thing [sic] to me and in spite of your work, which of course you love, I think I must mean something to you. We will be happy and sensible and loving through all the disappointments and [temptations?] that may come to us. I feel ridiculously serious to-day [sic] for I know not what reason. Perhaps just because I love you. This is Eleanor’s address in New Haven, Connecticut, where she lived with her family (Subgroup II. Eleanor B. Stevenson papers, Series 1. Correspondence, Box 1. William and Eleanor Stevenson Papers, RG 30/219. O.C.A.). While the letters in this mini-edition are all from Eleanor’s perspective, it is worth taking Bill’s words into account. Though from the tone of Eleanor’s letters, including this one, Bill might have been thought to be somewhat cold towards Eleanor, this is far from the case. 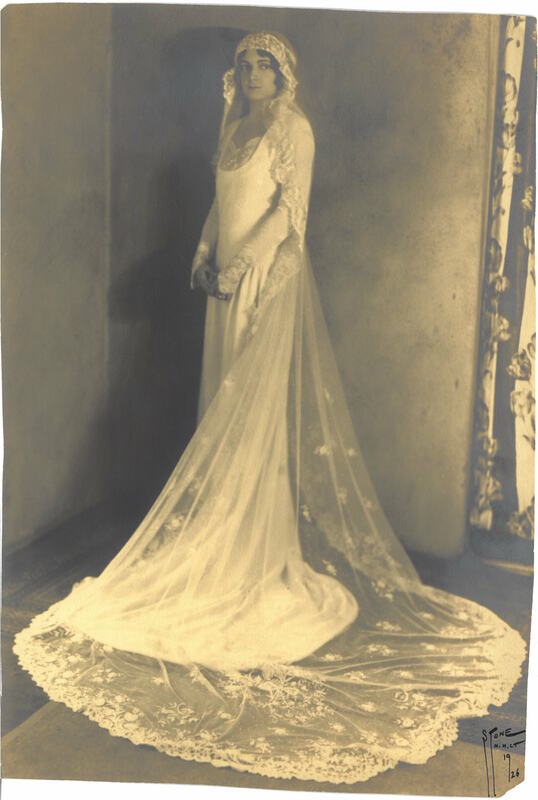 Bill’s correspondence is just as effusive, romantic, and sappy as Eleanor’s was. 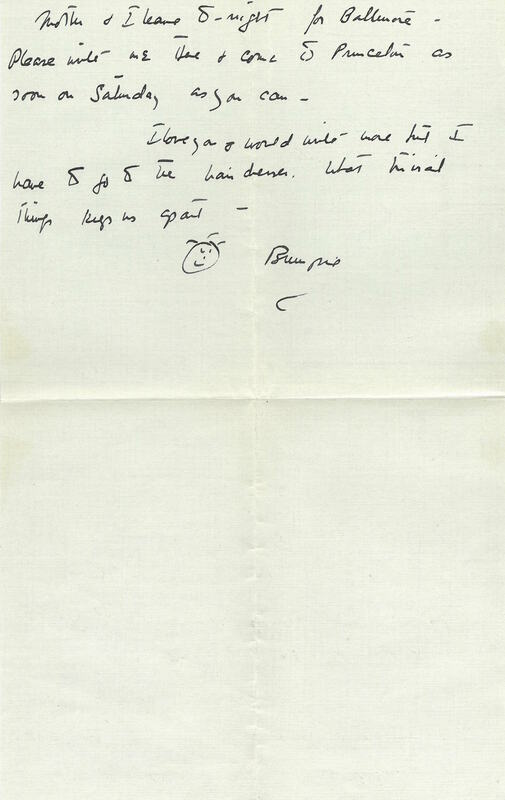 In his reply to this letter Bill says “The one thing in your letter which I didn’t like was you saying that you think that you must mean something to me- Darling, darling Bump, you mean everything to me that is near to my heart or is fine or is noble or is worthwhile. Naturally I am interested in my work but that is only a means towards my only end- that is you and all the happiness which that must involve. I love you and am devoted to you beyond possibility of mine explanation or expression. 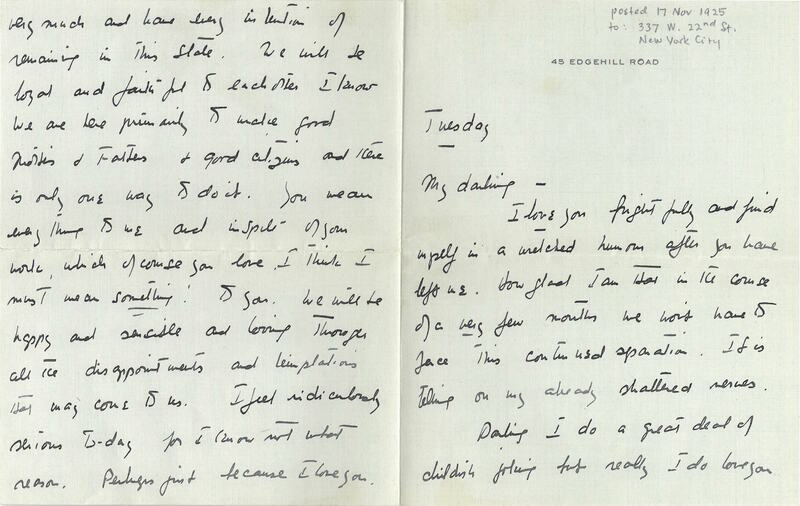 You darling.” (Bill Stevenson to Eleanor Stevenson, 19 November 1925. Subgroup I. William E. Stevenson Papers, Series 1. Correspondence, Box 3. William and Eleanor Stevenson Papers, RG 30/219. O.C.A. ).